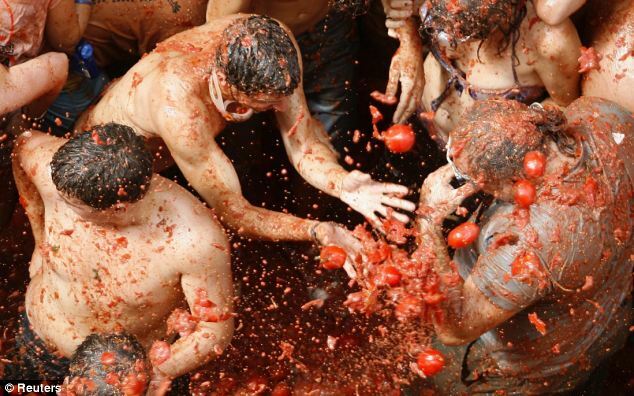 Revelers pelt each other with tomato pulp during the annual La Tomatina festival in Bunol, Spain. Did somebody say food fight? The world-famous La Tomatina festival in Bunol, Spain, got underway Wednesday, and from the looks of it, things got delightfully messy as usual. 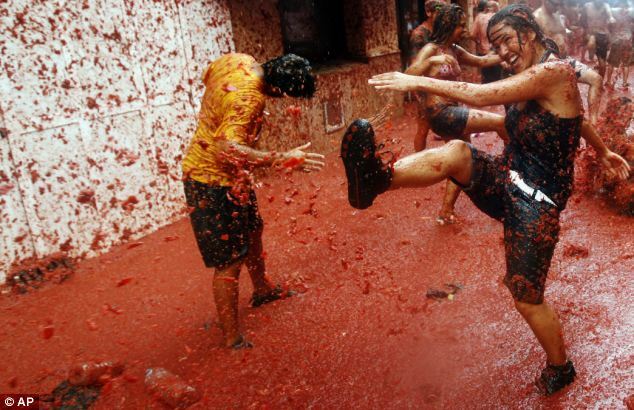 During La Tomatina, giant trucks roll into town and deliver scores of rotten tomatoes, which revelers grab, smash and throw at one another in an epic battle that leaves everyone — not to mention nearby buildings and city streets — covered in juicy red tomato guts. Many participants come prepared for the carnage in swimsuits, giant goggles and even costumes — but let's face it, there's no getting around 100 tons of tomato pulp. 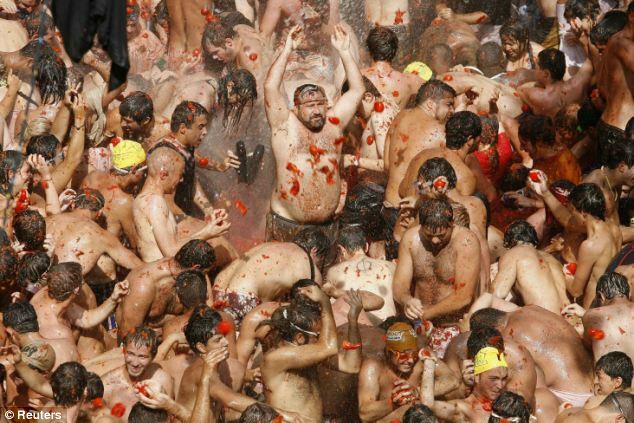 La Tomatina dates back to the mid-1940s. Its origins are unclear, but local lore holds the fight began as a spat between local merchants, or a tribute to the practice of disgruntled citizens throwing tomatoes at politicians. The small city of about 9,000 gets a boost of about 40,000 people during the festival, which is held on the last Wednesday of August each year and draws tourists from as far away as Japan and Australia. 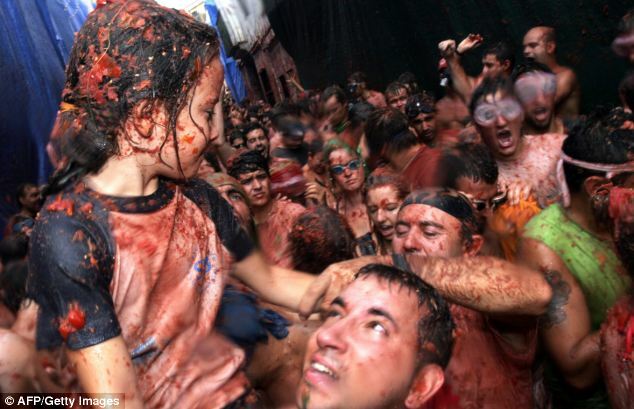 Thousands of revellers pelted each other with tomatoes today in honour of the Spanish town of Bunol's annual Tomatina festival. Over 40,000 took part in celebrations that saw the town's streets run with rivers of red pulp. The tradition, which began in 1945 as a food fight between childhood friends, has become something of a calling card for Bunol, which is 25 miles (40km) north of Valencia. The annual event, which takes place in the central plaza, now attracts thousands of revellers from all over the globe, and this year's was no exception, with festival-goers from as far afield as Japan and Australia. Tomatoes are provided by the local town hall and rules stipulate that in the interests of health and safety, the tomatoes must be squashed before throwing them — to avoid hurting people. A firecracker is let off to announce the start of the fight, and a second is sounded to declare the end. Tomatoes can only be thrown between the two blasts. Over 100,000kg of the summer fruit is estimated to have been flung, squished and trampled on. The hour-long battle is so popular that traffic into the town was backed up nearly two miles (3km) earlier this morning.